CMA Close Up editor Bob Doerschuk has left his position with the Country Music Association. He is currently looking for full-time or freelance opportunities. Doerschuk can be reached at 615-545-6461, or at musiccityscribe@gmail.com. CMA Vice President of Corporate Communications Wendy Pearl will be taking over Doerschuk’s duties. Media Manager Mary Gellott has also exited the company. Gellott’s career includes several years working as a concert promoter in Nashville, prior to her three years with CMA. She can be reached at mmggellott@aol.com. 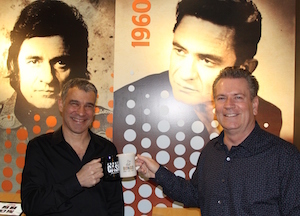 Nashville’s Johnny Cash Museum has teamed with coffee company Bongo Java to add a coffee shop to the museum. Bongo Java will open in late February at The Johnny Cash Museum’s 119 3rd Ave. S. location. A new radio station is coming to Nashville. WXNA, a “low power, high voltage” radio station, will broadcast at 101.5 MHz FM, with an effective power of 100 watts. A completion date has been slated for no later than June 4, 2016. Plans will place the station’s transmitter in the Germantown neighborhood, with signal to reach most of central Nashville, east Nashville, West End/Belmont, and south to the Berry Hill area. WXNA will also stream formats at wxnafm.org. The station will feature a freeform radio format similar to the former WRVU-FM Nashville. Freeform radio allows disc jockeys total freedom in the music they play (within FCC regulations), regardless of music genre or commercial interests. WXNA is wholly owned and operated by WRVU Friends and Family, a nonprofit organization founded in 2010 by former WRVU-FM DJs to oppose the sale of WRVU-FM’s broadcast license. Once the sale was completed, the mission shifted to establishing a new broadcast station. WRVU Friends and Family have no connection to Vanderbilt University. Former WRVU DJs working to bring WXNA to life include Roger Blanton (Delicious Elixir), Ashley Crownover (Set Records to Stun), Randy Fox (Hipbilly Jamboree), Jonathan Grigsby (Set Records to Stun), Heather Lose (Honky Tonk Jukebox), Laura Powers (Needles + Pins), Ron “DJ Ron” Slomowicz (Out of the Closet / Dance) and Pete Wilson (Nashville Jumps).